Medieval Monday with guest Laurel O’Donnell & a Giveaway! Welcome to the 11th week of our First Encounter theme for Medieval Monday. 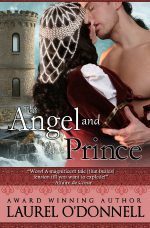 I would like to welcome back today’s guest, Laurel O’Donnell who has a snippet from her novel, The Angel and the Prince. Don’t forget to leave Laurel a comment here on my blog to be in the running for this theme’s giveaway. The winner will be randomly chosen at the end of this theme. Read on and enjoy! Ryen’s eyes glittered with the challenge. No man had ever needed two doses. But this was the great Prince of Darkness. A second dosage ought to bend his will, she thought, as she again touched the powder. The white flecks adhered immediately to her fingers. She raised her hand, but as she neared he turned away and her fingers brushed his cheek, moving across his open wound. Ryen pulled back quickly, staring down at his blood on her fingers. When she looked up she saw the Prince of Darkness force back a cry of pain. She knew he was cold. So very cold. His shoulders were hunched against the chill of the powder. Her gaze traveled over his naked chest. She was awed by the size of the corded muscles in his neck and shoulders, the firmness of his chest, the ridges in his flat stomach. His body shuddered, and then he was still. Follow along next week for Laurel’s next snippet at Nicole Locke’s website here. You can find my snippet on FOR ALL OF EVER at Laurel’s website here! Hey Sherry and Laurel, Well I can honestly say you grabbed my interest with your blurb above. How can two people who are suppose to be enemies, come together! Wow, really want to read this one!! Thank you so much! The Angel and the Prince was my very first book! It was nominated for the Romance Writers of America’s Golden Heart award. Glad you got to read the excerpt. Don’t forget to follow along next week! Hello Sherry and Laurel! The Angel and the Prince sounds so good! Thank you! I like that you took the cliche of her being an angel…and made it a terrifying moniker. 🙂 I love to do that! Hi Sherry and Laurel- You certainly peaked my interest with this excerpt from your book Laurel. I want to read it and have added it to my to-read list. Wow! Thanks so much. I’m glad you enjoyed the excerpt! This couple seems to have a very large obstacle to overcome. They are true enemies with opposing convictions. I would like to see how this story concludes. this is something i would really like to read. Thanks for hosting me this week, Sherry! It was my pleasure. You and your characters are welcome any time! Thank you so much, Sherry! But, be careful who you ask. Some of the characters are not so…social.